Our research has taken us down many strange roads, not to mention the occasional blind alley! The image portrayed on the Droeshout engraving of Shakespeare is quite bizarre and our story starts whilst we were trying to understand the picture. This innocent path took us along the mysteries surrounding the highly controversial Authorship Problem. We did not set out to embark on this strange journey, we simply wanted to produce the best Shakespeare website that we possibly could. 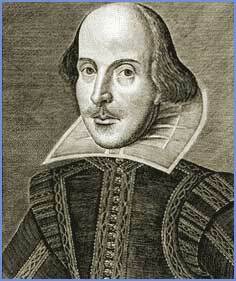 William-Shakespeare.info cannot provide a definitive answer to the Shakespeare Identity Problem. And although we have our own point of view, we do not wish to unduly influence our visitors or take advantage of the privileged position of Webmaster. We do, however, believe that we have made an original observation of the engraving which our visitors may find interesting also one that everyone will be able to debate. We have simply called it the " Collar Theory". There is no need to spend months researching the Collar Theory - just take a closer look at the Droeshout Engraving of William Shakespeare. There are many peculiarities about the engraving which have strengthened the arguments of the Shakespeare Identity Problem. The following comments and speculations have already been made about the engraving. The Collar - It has been suggested that the type of collar depicted on the engraving did not exist. This is not a style of collar that has ever been traced to any one else during this era, it appears to be completely unique. There is no neck and the head appears to be 'sitting' on the collar. We were intrigued by the Droeshout picture. 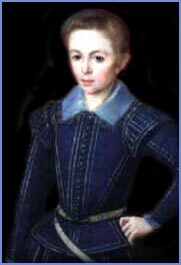 The collar, as depicted, would have been an impossible part of Shakespeare's apparel - the collar looks solid, it has no fastenings, how would you put this on? So we looked at the collar at all angles - if it was not a collar what else could it possibly be? It suddenly dawned on us that it looked like a shield. We cannot trace any other authors who have made a similar suggestion in relation to a collar / shield theory. It is really odd but once the observation has been made you can no longer see the collar as anything but a shield. The shape of the collar would be an unusual design for a shield as it has a concave, or bowed, top. All of the shields that we were familiar with had a straight top. There also appears to be a shield within a shield. Did such a shield design exist? Was there some significance to a shield within a shield? Our next step, of course, was to trace any shields of a similar design with the distinctive concave top shape. The image below illustrates the premise, together with our findings, and provides the opportunity for our visitors to take an even closer look. From our research and investigations it would appear that, according to 17th century heraldic rules, a shield within a shield signifies brethren. (Ref: A Display of Heraldire (1610) by John Guillim - this states that "this sort of imborduring heere spoken of, to be of the number of differences of brethren") It is perhaps no coincidence that the First Folio was dedicated to the two Pembroke brothers, Philip and William, referred to in the dedication of the Folio as 'the most Noble and incomparable paire of Brethren' Their father the Earl of Pembroke was the leader of the English Rosicrucian movement and their mother was the Countess of Pembroke. The mystery of the doublet also intrigued us. We are not tailors but these experts seem to be adamant that the figure was clothed in a coat composed of the back and the front of the same left arm. And indeed it does look like this, but we were still uneasy about the whole subject. During our research into engravings we found a similar doublet! The engraving below depicts The Duke of Brunswick and Sir Francis Bacon. 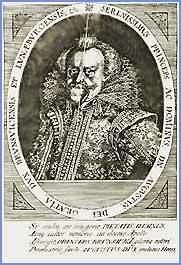 Same peculiarity with the doublet, the face appears to be split into two distinct halves depicting both Brunswick and Bacon. We then started to look at portraits from the era and found another similar doublet. Are the expert tailors incorrect? Have any recent investigations by tailors been made into this theory? Can any historians confirm whether doublets were occasionally designed this way? The next interesting connection to the Droeshout engraving of William Shakespeare is the strange changes to the image of William Shakespeare in the William Marshall Engraving on the second edition (1640) of Shakespeare's Sonnets. Please click the link to find out more.